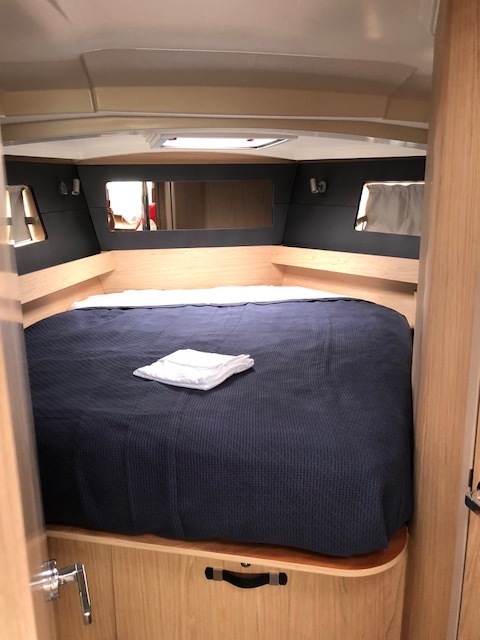 Beneteau Oceanis 41.1 is an excellent example of mid-size yachts with utmost comfort and space. The sleek modern outdoor design catches the eye and at the same time, natural lighting, customize wood and fabric choices for the interior makes this boat a top competitor among all other family cruise yachts. We did toppers throughout and bedding for this Oceanis client. We make everything custom according to the size and shape of your particular boat although, we specialize in latex. We prefer to use latex because it’s mold and mildew resistant, sleeps cool, very flexible so it’s easier to make the bed and get fitted sheets on, and it also holds up very well against body impressions. 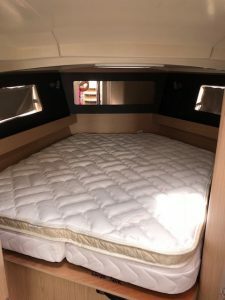 All of our toppers are made using a 2” layer of soft latex thick to provide a plush layer of comfort, wrapped in bamboo and are made from the same materials as our mattresses. 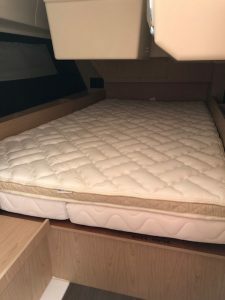 We custom make your topper to fit your existing mattress and include a nonslip underling to keep everything in place. We also did our 600 thread count Egyptian Cotton sheets and Matelassé blankets to finish up the look. Our sheets are sold as a set including a flat sheet, fitted sheet and matching pillow cases. Our Matelassé blanket here is a very practical choice for this bed creating a beautiful balance between modern and contemporary design. Made with everyday cotton and the rich texture of this blanket gives a very fresh and inviting feel to any stateroom. 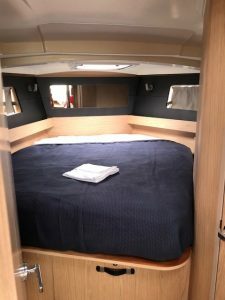 Every bed is different when it comes to yachts. Our designer’s goal is to provide you with choices that are pleasant and at the same time, practical according to our customer’s needs. We have a wide range of blankets and coverlets that you can choose from. You can mix and match your textures and colors and view our fabric on our website. We also carry sunbrella collection. Feel free to contact us if you would like to see our perennials collection and we will be happy to assist you. The images here speak for themselves. Adding our topper makes the bed so much comfortable for a great night sleep and well- fitting sheets and matelassé coverlet makes your life so much easier, allowing you to make the bed in a breeze.